Events conducted over an obstacle course including natural hazards such as rocks, mud, water, logs etc. Or manmade hazards such as walls, pallets, spools etc. And can have any number of sections. The riders attempt to negotiate each section without putting their foot down. Each dab (foot or hand) adds a point to the riders score. The rider with the lowest score wins the event. In the event of a tie in the top positions, the following tie breaker will be used. (in descending order) the rider with the most cleans; the rider with the most one's, two's, etc. ; The rider winning the run-off or winning an unused section. The "checker or observer", delegated by the event director, will be the maximum authority in the section. In the case of more checkers at the same section, they perform as helpers to the delegated one. Note: Touching allowed, leaning is not. Time:A course or event time should be established. All sections close at set time or all penalization cards will be turned in by set time. Section time will be set by the event director. However, the set time will remain constant for all sections. The recommended time limit is 180 seconds per section which starts when the riders front axle passes through the start gate, and stops when the front axle passes through the exit gate. Note:National events will have a maximum of 180 seconds per section, the checker or checker's assistant will be equipped with a stopwatch. The timer should advise the rider at one minute left, 3o seconds left, 15 seconds left (APPROX). Course:The observed trials area, including the sections and the boundary markers, flags and ribbons. Sections:A single segment of the observed trials competition. 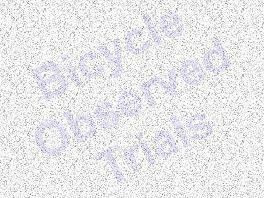 There can be any number of sections at any given observed trials competition but the typical number is between five and ten. Sections should be of a natural and artificial mix, varying in length, difficulty and the type of obstacles, testing the skills of the rider in balance, strength, agility and endurance. The section should have a minimum width of 1 meter (3s.37 inches), excluding log crossings. The sections should not be of dangerous form. A rider is in the section when the front axle passes the start gate, and is finished when the front axle passes through the finish gate. A rider may begin at any section unless specified otherwise, but once started must complete the course in order. Note:No one is allowed in the section except the riders and checkers. Note:Ribbons should be between 4" & 18" from the ground. ribbons marking section should be; red on right limit, blue on left limit. Dab:Any contact which provides support for the rider other than pedal, skidplate and tires. Note:When dabbing, the hands must remain on the handlebars only. Outside the Section:Either tire or axle passing outside the ribbon and flags, dabbing outside the section - 1 point. Gate Foul:Not riding the sections in proper order, not following the proper course markings, or entering or exiting the wrong gate. Junior: age 18 and under, 20" wheel minimum. Minimum of 5 riders per class or classes will be condensed. This is for all riders on traditional unmodified mountain bikes with a minimum 40" wheelbase, functional rear deraileur with 5 or more gears, no skid plate, no more than 10" of chainring clearance, and chainrings on one side of bottom bracket only, a minimum of 24" wheel in rear and a 26" front. A typical stock bike section may require the rider to negotiate tight turns on level ground, logs under 8", hills with questionable traction, and drop offs of less than 2'. Beginner and sport stock bike sections are designed to serve as an orientation to technical bike handling and to the trials scoring system. This is for competitors with modified bikes, minimum 20" wheel. Brakes on each wheel, propelled by a pedal crank system. Trials bike sections can have turns that are tighter than the turning radius of most bikes, unlimited logs or rocks, with vertical faces. Also drop offs, double logs plus all combinations of any type of surface. Any bicycle that is determined to be dangerous by the event director will not be admitted to that event. The rider may repair or replace the bicycle but if replaced, it must be a bicycle of the same class. If a rider is competing on both stock and modified bicycles, he or she may not ride a section in succession on both stock and modified classes.